Trifficly, Tottenham gaffer Harry Redknapp has threatened the FA with a post-match media blackout if they charge him for his criticism of referee Mark Clattenburg, re: Nani’s freak goal at Old Trafford on Saturday. According to PA, the FA is set to make a decision on Tuesday whether to analyse Redknapp’s criticism of “scandalous” Clattenburg, which included the dubious insinuation that the under-fire ref might “come up with a story that will make it all look right”. “If they want to make an issue of what I said then I’ll make some issues as well, don’t worry. “Don’t expect me to come out on the TV anymore – ever – and speak to the press after a game. Otherwise, what chance have we got? Redknapp also took issue with the timing of post-match interviews for managers, saying: “We shouldn’t be dragged out onto TV two, three, four minutes after a game. “I don’t want to go on TV; I’d much rather stay in the dressing room with the players. But when I’m asked a question, I give a truthful answer. Toys. Out. Of. The. Pram. I think sulking is when you don’t feel like you can take any action yourself… I don’t think he feels like that. Harry is one of the few managers who gives straight and honest answers to questions posed and long may he do so. Instead of pouring scorn on him why don’t you direct your considerable wit toward the FA? Or are you happy that they want to gag anyone with an opinion? Whatever your take on Saturday’s debacle you can’t deny the mess made of the situation by the man in charge? Harry’s comments, made minutes after the game, were surprisingly measured. If the FA can’t accept this then what’s the point of listening to any manager’s comments? We may as well listen to politicians. brilliant honest redknapp…do you think FA will charge fergie or wenger for what ever they said…sorry,no chance! I felt his comments were both justified and fairly moderate, consider that he started out by hailing clattenburg as one of the best refs in the premier league. Here is the point, or a couple of points from a Spurs fan perspective. First, I don’t blame Nani for taking advantage of a confused situation, although it was very unsportsmanlike which is Nani’s forte. Something to be expanded upon on at another time. The incident itself is slightly dodgy; however I doubt a Spurs player would not have done the same if presented with such an opportunity. The question with that statement is whether the goal would’ve stood. Knowing the environment, the location and the club the decision would’ve gone against. Second, ManUre was ahead and we didn’t look like scoring. If that incident hadn’t happened we probably wouldn’t have won, or even equalised as I think ManUre has enough defending ability to see out the game out. But that is just opinion as none of us knows what would happen if Spurs remained only a goal back. Just the same as press and pundits alike stating that England’s would be equaliser against Germany in the World Cup would’ve made no affect on the score had it stood. The United fans claiming the decision doesn’t matter because ManUre were already ahead quite simply misses the point – willfully I suspect, as the decision favours ManUre. My anger and ridicule is about a farcical goal conceded because the referee, Mark Clattenburg does not communicate his decision on the pitch. Look at the way this happened: Nani in the box; goes down after slight contact and grabs the ball pulling towards his body. He then drops it and Gomes grabs it. Nani is shouting for a penalty; we are shouting no, and the ref says nothing. Gomes drops the ball to kick, but is asking if it’s a free or goal kick. Ref still says nothing. ManUre players motion Nani to get back and defend. Only then does the ref motion “play on.” Nani taps in and the linemen – as confused as anyone raises the flag. No one knew what the situation was because the referee did not or would not communicate his initial decision. Spurs players had no idea; ManUre plays were running back to defend, and the linesmen did not know either. In my opinion, the ref is obligated to make sure his decisions are known. It isn’t hiding the ball; the ref doesn’t win anything for deception. He is there to control and facilitate the match. Clattenburg wasn’t doing this. Again, ManUre likely would have seen out the game at 1-0, but maybe not. We won’t know. We would have liked to have it still be a contest at the end. ManUre has dropped a lot of points late in games, and maybe it would have happened again. But for ManUre fans to claim a bum decision wouldn’t have mattered is just a rationalization. Lastly, I’m trying to figure out what argument Ferdinand would’ve had. He was at the other end of the pitch when this all went down, yet he was allowed to run 70 yards confront the referee and then listen in on the decision. All this while the Spurs players were ushered away and one – the captain – subsequently carded for contesting the decision. What pisses me off with that goal is not that it was a fluke, those happen. But it was the fact that Nani cheated twice, first diving, then handling the ball, and he not only got away with it, but he even got rewarded for it! How can someone whop has the guts to express an opinion adn stick to be accused of sulking. Another fine mess of an article Ollie, and you can’t blame Stanley thiss time. What is with the anti-Redknapp bias amongst the writers on this site? My advice to Ollie Irish ( if that really is your name ) is to watch the game through unbiased eyes. Then you might see what a bloody cheat Nani is. Manure always get preferential treatment, just like the Mendez goal that was five feet over the line, and another Manure cheat Carroll wouldn’t fess up to that either. I’m a United fan but I am 100% behind ‘arry. Clattenberg might have been correct by the letter of the law but he didn’t use a single piece of common sense, the outcome should and was supposed to be an advantage to Spurs but quite clearly ended up being an advantage to United. Whatever way you look at it Clattenburg fucked up somewhere if not everywhere and the big problem I have with this whole mess is that refs and their whole stupid association will NEVER take any blame or responsibility, even when it’s as clear as daylight. Start to take responsibility and then maybe you’ll earn some respect. Clattenberg gave no authority or clear decision during the mess and it is a FACT no one on the pitch knew what was going on, it was just a case of Nani taking advantage of the mess before anyone else. I rally hope ‘arry never speaks to the cameras, I’m guessing Fergie suggested it. Is right Arry lad ! 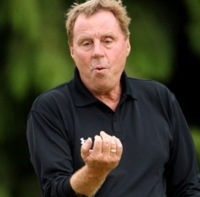 Redknapp to stop talking to the press? The pope will stop preying first! @ Neddyb. The Pope dosn’t prEy he prAys, big difference in the definitions of the 2 words with only 1 letter out of place. Right on Harry – don’t tell it like it is any more.